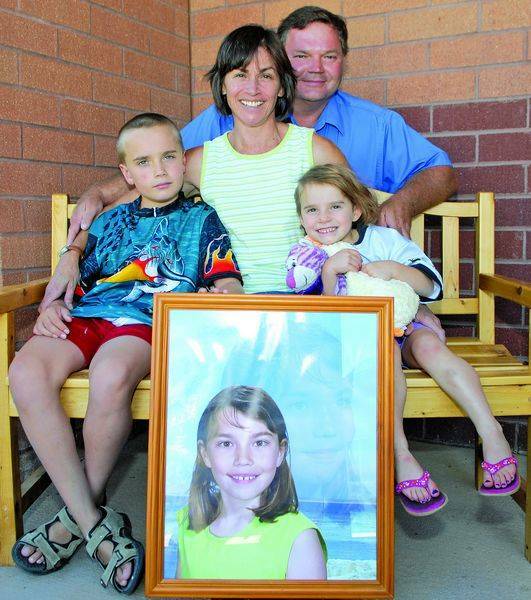 GLENWOOD SPRINGS ” Lorry Afonso-Carlson knew life would never be the same after she was severely injured and her 10-year-old daughter, Samantha, was killed while they were on a bicycle ride two years ago. But she has started pedaling again as one of the ways to try to recover from the tragedy. “That’s been my mental therapy,” said Afonso-Carlson, a former Basalt resident who now lives in Glenwood Springs. Afonso-Carlson is riding 50 miles today in the Tour of the Valley in Grand Junction, a fundraiser for St. Mary’s Hospital. The ride comes two years to the month when the driver of a car fell asleep on Highway 50 in Delta, crossed a rumble strip and drifted onto an extra-wide shoulder. The car struck the guardrail then plowed into Samantha at 65 mph and, seconds later, hit Afonso-Carlson. Samantha was killed instantly. Afonso-Carlson was knocked onto the hood of the car, splattered onto the windshield, then flew over the top. She remained clipped into her right pedal all the while, so she dragged her bike with her. Her injuries were as gruesome as those of many U.S. soldiers wounded in combat in Iraq. She had a concussion, broken neck, broken left shoulder, broken ribs and broken leg just above her right ankle. She suffered road rash from head to toe and severe gouges on her back and leg where the flesh disappeared. She received CPR three times immediately after the accident ” twice at the scene and once at the Delta hospital. She was airlifted by helicopter to St. Mary’s Hospital in Grand Junction, where her parents had the Catholic sacrament of Last Rites performed by a priest. Afonso-Carlson, now 46, persevered. She had a reputation as being tough as nails, despite her slender frame, among the early-morning workout crowd at the Gym in Basalt. Cycling was her favorite pursuit, and Afonso-Carlson’s devotion to the sport intrigued her daughter. Lorry rode in the 2001 Ride the Rockies multiday tour of Colorado’s mountains. Her husband, Rex, and Samantha followed along in a vehicle and her daughter was impressed by the “sea of bikes,” Lorry recalled. It got Samantha inspired for cycling. She began riding with her mom. Samantha impressed the riders in the 2003 Tour of the Valley in Grand Junction, where she completed the 30-mile leg of the ride as an 8-year-old, one of the youngest riders ever. She returned to ride the 30-mile circuit in 2004. That annual tour was Lorry and Samantha’s thing, something they did together. Their goal was to eventually buy a tandem bike and tackle Ride the Rockies together. To reach that goal, Samantha planned to ride the 50-mile leg of 2005’s Tour of the Valley. The Carlsons, who moved from Basalt to Glenwood Springs earlier this decade, also have a place in Delta. On weekend visits to that town 37 miles outside Grand Junction, Lorry and Samantha trained along Highway 50 because it had wide shoulders they thought would keep them from harm’s way. They were on a modest training ride on separate bikes on Sunday, Aug. 14, 2005. Samantha had been riding out front as they rode with the wind. At the turnaround point, Lorry took over the point to let Samantha draft. Lorry’s last words to her daughter were, “Don’t forget to wave to the alien.” Their route took them past an alien yard sculpture. Richard Hilton, then 47, was driving southbound in a rental car that same day. He had been on a Greyhound bus from Denver to Grand Junction. He and two other bus passengers rented a car when they missed their bus connection to Durango in Grand Junction. Hilton told Delta police after the crash that he fell sleep. The two female passengers also said they were sleeping at the time. Hilton was sentenced last year to one year in jail on work release, an additional two years or probation, ordered to pay restitution and 365 hours of useful public service. Afonso-Carlson questions if the sentence matches the grief he caused her family. Rex Carlson had the grim task of telling his severely-injured wife that their daughter died. “I didn’t get to say good-bye,” Lorry said. She was too severely injured to attend Samantha’s funeral. She hasn’t been able to watch the video tape of the funeral yet. Afonso-Carlson spent eight days in the intensive care unit at St. Mary’s Hospital and another three days in acute care. She returned to their home in Glenwood Park after five weeks. An outpouring of support from neighbors and extended family helped Lorry and Rex cope. They have two other children, William, now nine, and Maria, now 3 1/2. Lorry wore a halo to stabilize her broken neck for three months. The recovery from her various physical injuries is slow but steady; the emotional healing will probably never end. Her primary doctor told her she probably wouldn’t be able to fully use her right leg, like in weight-bearing exercise, until late 2007. Afonso-Carlson was determined to recover sooner. She was back on a bike by July 2006. One month later, on the anniversary of the tragedy, she rode out alone to the spot where the car struck her and Samantha. “You keep playing it over and over and I keep hoping for a happier ending. It’s just not going to happen,” Afonso-Carlson said. But she said the trip proved to her what she had always suspected ” she hadn’t done anything wrong to contribute to the accident. She and Samantha were wearing helmets and bright-colored clothing. They were to the far right of a shoulder that’s actually slighter wider than the traffic lanes. Afonso-Carlson had seconded-guessed herself about whether Samantha should have been out front, but concluded it just wasn’t feasible with the head wind. And now, a year later, Afonso-Carlson is riding again ” to help with the healing and pay special tribute to Samantha.